From Commoner to Royalty and Back ! For someone who hates any sort of attention, I did get a lot of it the minute I was born. I was rather tall for a newborn and every doctor and nurse in the All India Institute of Medical sciences hopped over to my Mom’s room to have a look at the tallest baby anyone had ever popped out! Mom was obviously exasperated and as she confessed to my aunt, she felt as if everyone was accusing her of smuggling in a month old baby instead of a new born. Before I was born, my brother had ruled over the Shukla family in solitary splendor for 8 years. Then, thanks to me he was unceremoniously dethroned. Till then, he was comfortably encosed in his world of toy warships and cars, with the entire family revolving around him. Enter younger sister into this idyllic existence and he suddenly didn’t know how to fit me into the scheme of things. Luckily for him, because my Mom had to go back to work and my Grandmother couldn’t bear to see me being looked after by a nanny, I was taken away to my Grandparents home. Thus began the golden period of my life! When my brother was born, my parents were in Calcutta so no one got the chance to mollycoddle him. This time, I was right there and never the ones to miss a good opportunity, they wasted no time in spoiling me! My life you see was made. Oh I was such a pampered child! My every whim and fancy was their command. My grandma planned her whole day around me and my aunts never came home from work without bringing something for me. Other assorted family members plied me with sweets and toys. My aunts loved to dress me up and take me out. Even one sneeze, one little cough from me used to send them scattering about like headless chickens flapping their arms and worrying. And on hot summer nights, when power cuts and mosquitos abounded, they spent the whole night carrying me in their arms and patting me to sleep. But the most amazing thing was the change in my grandfather. He was then the Principal of a school, a strict disciplinarian, and everyone from the family to his teachers and students was petrified of him. Although he loved his children, he never displayed any emotions towards them. All this changed with me. I looked at him once out of my big liquid eyes and he melted. The family had to face his wrath if I as much as whimpered and there was no one to pick me up. According to my grandmother, he never ever picked up any of his children but I was mostly to be found in his lap. I was allowed in his room and he didn’t mind when I waddled all over the place overturning his books and papers and playing with his spectacles. This man who hardly spoke would tell me stories any time I asked for them. And he was the one who gave me the greatest gift of my life - By teaching me how to write. But then all good things must come to an end. I reached the school going age and my parents decided to call me back. So very reluctantly, amongst much drama and tears, I left the tender loving care of my Grandparents and went back to Delhi. My parents were the loving kind, but were not the ones to fuss over their kids unnecessarily. No special treatment was doled out to me. And so ended my days as the Royal Baby! I was back to being a commoner! 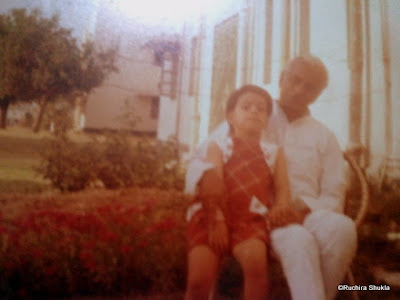 Here an old grainy pic of me with my grandfather. aah...ruchira we have had such a common(royal) childhood...though mine happened due to a different reason, i was first born and also a girl child in a long time in both sides of the family...my dad broke his hip joint just days after i was born and my grandma(taking the opportunity) thought it was best that i go back with her to kolkata...and then my royal life started much like yours..my mamajis have pampered me silly and continue to do even today....and like you my royal life ended when it was time for me to enter pre-nursery!!! Same here. All my Buas still continue to pamper me even at this age ! Time spent with grandparents is such a Golden time isnt it ! Let me write mine, it would be quite similar. Including the tall part. Though strange twist of fates I stopped growing after class 6. How grandparents should be given the honorouble right to bring us up! Oh most definitely they should be ! Look forward to reading yours Richa ! That's cool. Grand parents are the coolest. But, sadly for me I had mom's mom and dad's dad. My granny was suffering from arthritis and my grandpa was not really close. But, we were close knit and have such wonderful memories. Grandparents are definitely the coolest ! Childhood memories are the best aren't they ! Well, I am jealous. At least you got pampered for a few years! I really think your nostalgic posts are your best kind! I was brought up at my Dadaka ! So true na .. hum slowly kitne garib ho jaate hai ! We dont even realize how precious childhood was till its gone ! Well written... I just loved the way u started this post. The first paragraph. Thank you Prakhyat. And welcome here ! That must have been so much fun ! Makes me feel I need to write something as well.. absolutely lovely time no.. with grandparents.. relived quite a few memories reading yours Ruch..
Time spent with grandparents is always lovely ! I miss it too ! Thanks for sharing, Ruchira. Your royal early days still show - and that's a compliment. To feel the love of extended family besides your own parents is a great blessing! My brothers and I enjoyed lots of interaction and love from our grandparents and my Dad's many siblings! Thanks Corinne. To feel the love of your family is indeed a blessing ! Reading about your childhood, reminded me about Aaryan. You bet they are the best. Its amazing to see how people change for kids isn't it ! I was the first born for both sides of the family and the love showers were endless. I can so very well identify with your post! Grandparents are a bliss! I never had the good fortune of living with my grandparents at all and have always craved for their love. This is a great story Ruchira. Am sure, you are no commoner, you're special because you have the love of so many people in your life :) God bless! Somehow our fondest childhood memories invariably centre around our grandparents. And Ruchira, you still stand out for your height! Yeah, i do, Don't I ! I so can relate to all the pampering you received in your childhood. When my younger sister was born, the 2 year old me was sent to grandparents house...my bestest one year!! it must have been the bestest ! A lovely post :) My folks lived with my maternal grandparents so I too was raised with a lot of pampering by aunts and uncles, until my brother dethroned me :D P.S. Do mind me asking where the scenic pic on your header was clicked? It is truly breathtaking. Welcome here Jane. TI clicked the pic at Pangong Lake - Ladakh. Lucky you, I was with my grandmother for few months and then I nearly drowned and was sent back. :( You were a princess for sure. I have a picture at home wherefive YES-FIVE- of our generation is included. I wish I had such grandparents. I was never pampered like this. I am totally jealous. I have never really enjoyed my grandparents company because they left a little too early. Loved the post. On Writing a Haiku !